 Log In needed We do a shed demolition. We or taking bookings for shed demolition. Are you tired of looking at that old shed on your property? Junkman Specializes on Shed Removal! Are you looking to replace that old raggedy shed with a new and better one? Junkman get rid of that old shed for you! Or do you simply need do tear that shed or storage for more space? Whatever reason you have to break down a shed. Junkman will take care of it all. Our professionals will not only dismantle the shed and break it down, but also remove all debris and unwanted items from your property. We will also clean, sweep.We will do what ever it takes to get any shed done to your complete satisfaction because at Junkman. 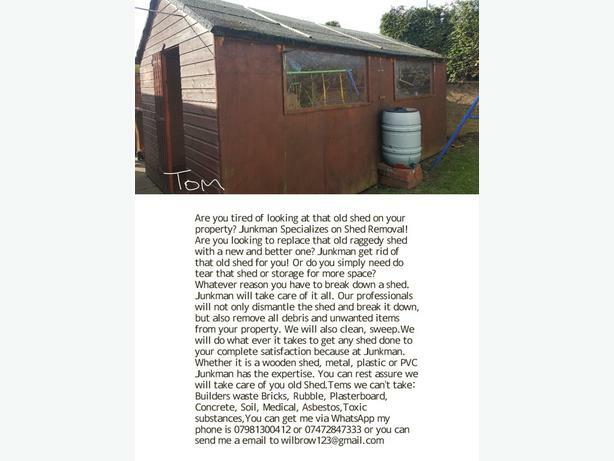 Whether it is a wooden shed, metal, plastic or PVC Junkman has the expertise. You can rest assure we will take care of you old Shed.